God has built into us a natural stress reliever: the human body's unique ability to shed emotional tears. When we cry, our body chemistry is actually re-balanced. We not only feel better, we are better! Yet, those crying jags can come at the worst times, so let's talk about this "new normal" today and help each other navigate and find our way through tears. They're unpredictable. We don't cry when we think we should; other times a crying spell can hit right out of the blue. I can think of many examples. 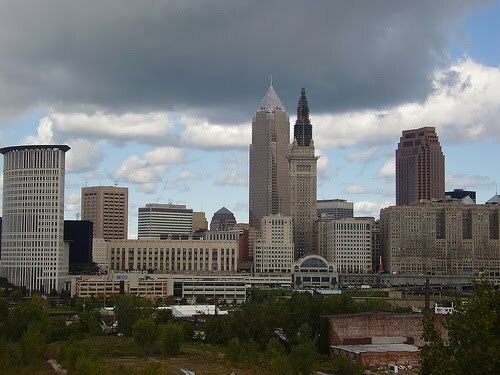 I'll never forget an older black man who got in an elevator with me in a parking garge near downtown Cleveland. I wasn't in the best of neighborhoods and I really didn't want anyone in the elevator with me, but sometimes, what can you do? I was nervous, but we were in a glass elevator, and for small talk we commented on our view of the Cleveland skyline. It was just a few weeks after 9/11 so we talked about what if our landmark--Terminal Tower-- was a big gaping hole like the Twin Towers in New York City. We grew silent, the elevator came to a stop, and then the man started weeping. We exited and he walked over to a concrete ledge of the walkway from the parking garage. Leaning on it, wiping his eyes and trying to collect himself he tried to explain: "I was in the Korean War," he told me. "My platoon. . . . we lost so many . . . "
I'll never forget Uncle Bill at Christmas time after Aunt Barbie passed from battling cancer. The aunts, uncles, cousins and Great Grandma Bowman all sat visiting in the living room as little kids ducked in and out, jazzed on sugar and sweets. You know how sometimes it's loneliest when you're in a crowd? Bill sat there with tears streaming down his face. We were all awkward and didn't know what to do. My 4 year-old Lisa was the smartest one in the room that day. She climbed into his lap and let him cry. A friend of mine who lost her father worked so hard to get through the grief. She thought she'd gotten most of the tears out of her system. Then 4th of July struck. She spent most of the holiday afraid to go out without breaking down. She didn't know where it all came from until she remembered that her grandma had died twelve years previously on 4th of July weekend. A few times since we've been married Tom will hear a song on the radio or tv, and I'll catch him with tears in his eyes. He finds me in the same way, too, every now and then. We appreciate that we can put an arm around the other and let the tears pass. We don't make them stop. We know they'll stop when they've served their purpose. Why do I share these sad stories with you? Because they're beautiful. You see, God made us in His image, and the fact that we grieve is evidence of His image. We grieve because we love, and God is love. We remember because God remembers. Those profound memories like the Korean War, Grandma's funeral and our mate's death revisit us because God has set eternity in our hearts. Our compassion has no timeframe; emotions and grief aren't linear with a beginning and an end. God created us in His image as eternal beings. Sure, we move on; grief becomes bearable; memories become more a matter of honoring. Yet every once in a while, out of the blue, the tears will come like a suprise rain shower. As if the sorrow was yesterday instead of months or years ago. Everytime that happens I learn something about myself and stand in greater awe of my God. How about you? I think we can talk about this without getting stuck and wallowing in sorrow. Do you remember a time when tears caught you by surprise? What happened? And what would you do if it happened again? Let's start out with some light-hearted questions. Like last week, copy and paste these questions into the comment box and then answer the ones you want to. 1) Do you like Puff Plus with moisture creme or just regular Kleenex? 2) When you cry are you all dainty and dabbing at your eyes and nose? Or are you like me, sobbing and snarking and a real mess? 3) Where is the worst place you've had a crying jag? 4) Share a brief experience or a piece of advice about emotional meltdowns in public. 5) Share a Bible verse that has spoken to you about your grief. l) Definitely Puffs with lotion! Before Ken passed I would buy the cheapest thing available - found out the hard way they were not very kind to my eyes and nose! So now it's the lotion ones even if they aren't on sale! - They also don't fall apart and leave those little while flecs all over my face! 2) I cry both ways - sometimes it's very dainty and other times it's enough to make my poor Isabelle kitty go running the other direction! 3) I work in a school and that is definitely a place where I don't want to break down - not because I am ashamed of it but because it is difficult for students to understand. However, God being God allowed me to be blindsided one day a couple of weeks ago. Sitting during band suddenly the song they played brought back a flood of memories and the tears came! Oh No! I quickly left the room and headed for the girl's room and oh no - there was another younger person there (like in her 20s) who I had just met who had not been too friendly - however, I was stuck and had no choice - I was crying and had to finish the bout -God is awesome - that experience was exactly what was needed to bridge the gap between our generations - she was so kind and helpful. 4) I don't worry about meltdowns in public. I am a widow - widows hurt, widows cry - that's reality. I go about my life and if I get blindsided - oh well - that's just the way it is - my tears are a gift because when I cry God is very near to me for it is then that He bends low and collects those tears in my bottle - so in answer to scripture Ps 56:8 and Ecclesiastes 3 - there is a time or a season for everything - Ken's season now is in heaven - mine now is passing through grief - soon I will have a season for joy and laughter - as surely as the sun travels across the sky and turns night into day I will too pass into a season once again of joy and peace - where I will laugh and bloom in God's presence, fullfilling his plan for my life. Currently I am in a season of resting and healing - and that's ok - 'cause God has a plan and He is soverign - He never makes mistakes and He knows what He is doing. 1) Do you like Puff Plus with moisture creme or just regular Kleenex? Regular Kleenex have gotten smaller and thinner, so I like the thicker, softer Puffs if I'm crying and wiping a lot! 2) When you cry are you all dainty and dabbing at your eyes and nose? Or are you like me, sobbing and snarking and a real mess? Generally a sobbing, snarky mess! 3) Where is the worst place you've had a crying jag? Actually it was a Hallmark store, but they were kind and gave me a tissue when I asked for one! 4) Share a brief experience or a piece of advice about emotional meltdowns in public. Play the widow card when you need to if you have a meltdown. Just say, "My husband died..." (you don't have to say how long ago), and most people will be sympathetic and understanding. 5) Share a Bible verse that has spoken to you about your grief. Ps. 27:13-14 - I would have despaired had I not believed that I would see the goodness of the Lord in the land of the living. Wait for the Lord; be strong, and let your heart take courage. Yes, wait for the Lord. 1) Do you like Puff Plus with moisture creme or just regular Kleenex? I don't like the lotion, but have to have quality, soft tissues. 2) When you cry are you all dainty and dabbing at your eyes and nose? Or are you like me, sobbing and snarking and a real mess? I think the dainty crying is for when you are trying to hide it. Otherwise, its messy. 3) Where is the worst place you've had a crying jag? Only ones I can think of are 2 times: 1. a few weeks after my husband died, I took the Amtrak train across the country to visit my daughter in Denver. I sat in the very last seat in the very last car, and there was a group of singles in front of me, laughing and having a good time. I cried during the entire trip, they didn't ask why, but were kind and apologized for having fun - but I told them it was ok.
2nd time - almost 2 years after my husband died. I was walking into the small church for the baptism of my husband's Godson's - sons baptism. I broke down when I walked in and saw the entire clan and the baby's Great Grandparents whom I had not seen since my husbands death because they live in another state. I could not stop crying during the entire Mass and Baptism - luckily my friend(the baby's grandma) grabbed me, sat me next to her, hugged me and sat close to me. First time anyone did that for me. I also like "there is a time and season for everything"